A year ago this weekend, the Dow Jones industrial average had just finished a slow-motion crash. Over eight days, it fell 2,400 points, or 22 percent, and stood at 8,451. One year later, the Dow is at 9,865. It's up 51 percent from a 12-year low of 6,547 on March 9 _ when some investors feared the financial world was coming to an end. But the complete story of the Dow's journey since the economy soured goes back a little further. Two years ago this week, on Oct. 7, 2007, the Dow set its record high of 14,164. What followed was a three-act play. For five months, from October 2007 through the collapse of investment bank Bear Stearns in mid-March 2008, the Dow fell 2,000 points in an orderly fashion as investors anticipated a garden-variety recession. 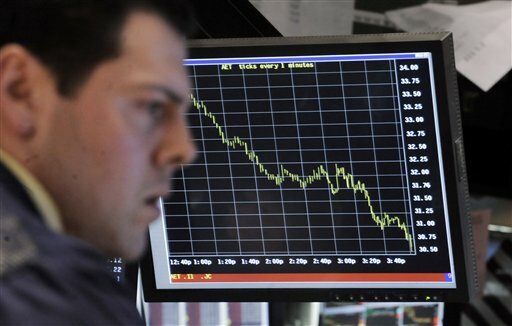 From mid-March until Labor Day, the Dow rose and fell but was little changed. Right after Labor Day, Fannie Mae, Freddie Mac, Lehman Brothers and AIG failed over 10 days. The credit markets froze, and investors panicked, fearing another Great Depression. There were rallies amid the downward spiral that ensued, but over six months _ until the low on March 9 _ the Dow fell 5,000 points. So where do we stand today? The seven-month rally since March has yet to wipe away all the losses, but few expected that the Dow would be edging back to 10,000 so soon. Unemployment is close to 10 percent, but other parts of the economy are stabilizing. Consumers are still hunkered down, but retail sales showed a slight gain in September. The panic of last fall has been replaced by the resignation that the worst is over but it might be years before the economy booms again. "The problems that we're dealing with _ there's a little bit less urgency," says Alan Levenson, chief economist at T. Rowe Price Associates. "We've stopped what could have been fatal bleeding." _ $11.2 trillion: Total losses in the stock market from the Dow's peak in October 2007 to the March 2009 bottom. _ $4.6 trillion: Total gains in the stock market since March 9. _ 6: The number of the 10 worst point drops in the 113-year history of the Dow that occurred in 2008. The 777-point drop on Sept. 29, 2008, ranks No. 1. _ 3: The number of the 10 worst percentage drops that occurred in 2008. The Sept. 29 decline of 9 percent is the third-biggest behind 22.6 percent on Oct. 19, 1987, and 10 percent on April 14, 2000. _ 92 percent: Decrease in Citigroup Inc.'s share price from Oct. 10, 2008, ($13.90) to March 9 ($1.05). _ 341 percent: Increase in Citigroup's share price from March 9 to Friday's close of $4.63. _ 18-20: The historical average for the Volatility Index of the Chicago Board Options Exchange, also known as the VIX, or "Fear Index." _ 89: Where the VIX peaked last October. _ 23: Where the VIX was on Friday. _ 16 percent: The amount by which the Dow's closing level on Friday was higher than its average close the previous 200 days. Earlier this month the number hit 20 percent, the highest since the early 1980s. _ $6.5 trillion: Value of assets in stock mutual funds at end of 2007. _ $3.7 trillion: Value at the end of 2008. _ $4.5 trillion: Value at the end of August. _ -$72 billion: Net cash flow (money put in minus money taken out) for stock mutual funds in October 2008. _ -$25 billion: Net cash flow in March. _ $4 billion: Net cash flow in August. _ $9: The amount, out of every $10 investors put into mutual funds in August, that went into bond funds. _ $855.40: The price of an ounce of gold on Oct. 10, 2008. _ $1,048.60: The price of an ounce of gold on Friday. _ 6.2 percent: Unemployment rate a year ago. _ 9.8 percent: Unemployment rate today. _ 95.2: Consumer confidence two years ago. Reading above 90 means the economy is n solid footing; above 100 signals strong growth. _ 25.3: Consumer confidence in February _ record low. _ 53.1: Consumer confidence today. _ 2.8 percent: Decline in retail sales in October and December 2008. _ 2.7 percent: Increase in retail sales in August. _ 4.75 percent: Federal funds rate two years ago. _ 1 percent: Fed funds rate last October. _ 0 - 0.25 percent: Fed funds rate today. _ 4.81 percent: London interbank offered rate (LIBOR), the amount banks charge each other to borrow money for three months, at its peak, on Oct. 10, 2008. _0.28 percent: Three-month LIBOR rate Friday. _ -0.5 percent: Personal savings rate in 2005 as home prices were soaring. _ 6.9 percent: Personal savings rate in May. _ $975 billion: Credit card debt held by Americans last September. _ $899 billion: Credit card debt held at the end of August, down 8 percent. _ 7 million: Home resales in 2005, a record year. _ 4.5 million: Home resales in January at annual rate. _ 5.1 million: Home resales in August at annual rate. _ $245,000: Median price of homes sold in 2006 _ record high. _ $213,000: Median price of homes sold last October. _ $195,000: Median price of homes sold in August.